The Swiss Permafrost Monitoring Network (PERMOS) systematically documents the state and changes of mountain permafrost in the Swiss Alps. PERMOS was initiated in the 1990ies and is operational since the year 2000. The network receives substantial financial support from the Federal Institute for Meteorology and Climatology MeteoSwiss through GCOS Switzerland, the Federal Office for the Environment FOEN and the Swiss Academy of Sciences (SCNAT). PERMOS is carried by six partner institutions: Universities of Fribourg, Lausanne, and Zurich, ETH Zurich, University of Applied Sciences and Arts of Southern Switzerland SUPSI, and the WSL Institute for Snow and Avalanche Research SLF. This web site provides information on the monitoring strategy, observation sites, PERMOS partners, and PERMOS Supporter (funding institutions). 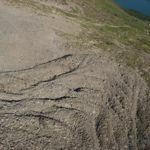 All PERMOS publications as well as general information on mountain permafrost are also available. PERMOS includes three types of observations which are taken at sites on different landforms in varying topographic settings: (1) ground temperatures measured in boreholes and at the surface near to the drill site, (2) changes in subsurface ice and unfrozen water content at the drill sites by geo-electrical surveys, and (3) velocities of permafrost creep determined by geodetic surveys and photogrammetry. In addition, fast mass movements from permafrost areas (e.g., rock fall) are documented. Did you observe rock fall in the Alps...?